The roads of Mumbai have huge hoardings of the Kala Ghoda Arts Festival (KGAF). Name of the sponsors are more evident than the name of the event. Black and White theme of the posters with a colourful surf excel logo look quite interesting. My numerous visits to Colaba and none at KGAF has left me curious - space management is the question I have been thinking about; which is answered as soon as I reach there. Whole place is transformed completely. Shops and restaurants have moved two steps backward to make space for the colourful stalls; each corner has something to offer - from food to eco-friendly Tees, bags, wall pieces, paintings, artifacts, jewelleries and such. Among these colourful stalls, we find the Kala Ghoda (Black Horse). This Black Horse has a different story to share altogether. There is a change happening around me, which has speed. There is a drought of pure and honest thoughts. Creativity has dried up, relationships are breaking apart like hollow branches, responsibilities are too heavy to sustain. Minds are lost in the dry jungle with no freshness; only dry creepers entangling everything around. Humans have the power to change it, but the power is in DROUGHT. We are waiting for our wills to act, to break the shackles and free our self. Waiting for the shower of freshness which is only possible if we are greener from minds and hearts. There is a change happening around me. I am fast. NO. I was fast. 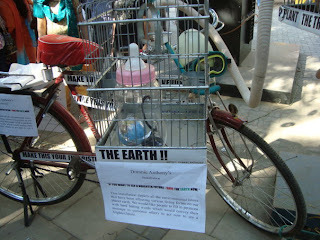 There are many messages about saving our earth. Many images that move your heart; leaving you wondering about what we have done with our planet and what we still are doing. 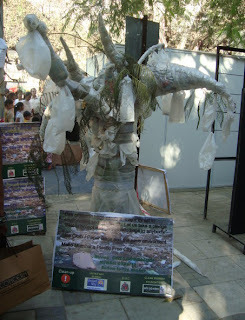 Extensive use of plastic will soon take over our trees too; if at all there will be any remaining then. Domnic Anthony insists on installation of the earth with this unique concept! And the image that left me really curious. 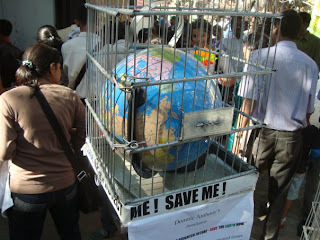 I spotted it when I entered the KGAF. I do not know the meaning behind it. 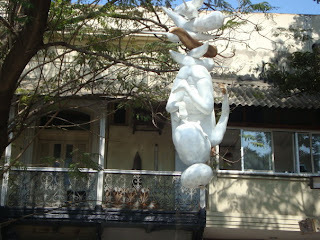 If any of you has visited KGAF and know the meaning behind it, please let me know. KGAF is truly a wonderful experience. Such diverse, intelligent, ingenious thoughts shared via various art forms! It's a treat! Been there once! Thanks for sharing this year's festival!! Very interesting Arts Festival. I am sure people visiting this festival will come away with a wonderful experience. You guys in Mumbai are lucky. quiet interesting! 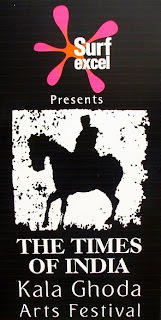 Ya the surf logo esply with the hot pink color is appealing in the black background. Very nice, creative and informative pics! Thanks for sharing! The Last image is of, what I guess is, of infant killing! When I closely saw this photo, I found it as an infant. The message would be to stop infant killing! I hope this is the real meaning behind it!! Thats some thoughtful festival. Hope you had nice time there. What did you buy there? Perhaps , the last picture has something to do with the girl child?? I have old memories of this place. All the pictures are very nice. The first image of the poster is really ironical juxtaposed to others. SUrf excel, a detergent that is quite injurious to water table and soil is the sponsor. You might have seen that open drains through which detergent flows continuously have few plants growing by its side. 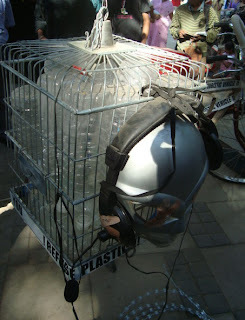 They sponsor a show that ttalks of fighting environment pollution. All the same, Kala ghoda is real cool and one of waking up exhibitions in the country. It seems very interesting and also educating. Hmmm... the last image is puzzling. Never been to one before.The Drought really compels one to think .The displays are interesting and on clicking the last picture it looks like an infant hung like nimu-mirchi(? )...may be something to do with infant killing but i don't get the message very clearly here. Neha thanks for sharing the glimpses of this event with us. good photos and sensible post...congrats..btw..neha here's a pat for yr gr8 sense of humour: "O meri behna, gale milti rehna :)"
Those were some great pics with details about them. I've heard so many people talk of this festival and talk of some great plays -- Chanakya ? , featured in there, but none had snaps. This is great. @ SG, I realized this after twelve years what I have been missing..it was wonderful..
@ Lakshmi, welcome here..thank u for ur comments..I quite like the drought concept too..
@ Megha, thanks..my guess is as good as yours about the last image..
@ Harini, last image is very disturbing..
@ Madhu, unfortunately, I visited this place in the afternoon..so couldn't catch up with a single performance..it is indeed a better thing than those "dog" fights..
all right neha, i discussed with my hubby what could the last image possibly convey. he got it at the first look - it's abt female infanticide. tht nimbu mirchi symbolises keeping evil things away. they have used a girl child between the nimbu-mirchi. But the way the model are made they do convey the message nice and proper. 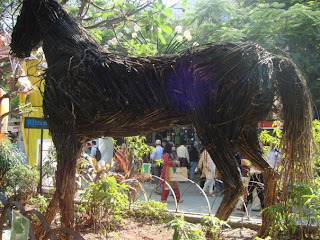 Sad, I did not go to kala ghoda fest this time...its always wonderful to be around that place during that time. It is the time when artists get a real platform to showcase their talent.